Most of the time, I buy fresh fruits and veggies with a specific purpose in mind to use them – either in a recipe or as a snack. Sometimes though, I’m a little impulsive in the produce mecca that is Whole Foods and I recently picked up a quart of strawberries feeling thrilled to have found in-season Florida strawberries in the beginning of April. Here in the Northeast, strawberry season doesn’t happen until mid- to late-June…that’s a long time to wait for fresh, local strawberries! 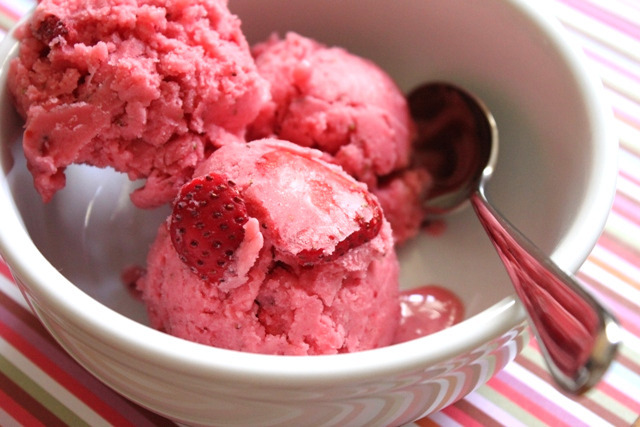 So I got home, ran a few recipe ideas through my head and started craving strawberry ice cream. I’m not sure why since I’ve never been a fan of it but I pulled out The Perfect Scoop and found this frozen yogurt recipe. It sounded wonderfully fresh and since I had some Greek yogurt to use up, I knew this was what I was looking for. When I say this was one of the most simple frozen dessert recipes I’ve ever made, I’m not kidding. The strawberries are macerated then puréed with the yogurt and some lemon juice, chilled, frozen in the ice cream maker…and it’s done! You can eat it soft or freeze it in the freezer. I reserved about 1/4 cup of the strawberries before I puréed them and mixed them into the soft frozen yogurt and just loved the chunky berries throughout the smooth frozen yogurt – the recipe below reflects this minor change. So if it’s been a while since you’ve used your ice cream maker, dust it off and don’t waste another moment before you make this frozen yogurt…you won’t regret searching out some nice fresh strawberries! Slice the strawberries into small pieces. Toss in a bowl with the sugar and vodka or kirsch (if using) until the sugar begins to dissolve. Cover with plastic wrap and let stand at room temperature for 2 hours, stirring every so often. Reserve 1/4 cup of the strawberries on the side. Transfer the remainder of the strawberries and their juice to a blender or food processor. Add the yogurt and fresh lemon juice. Pulse the machine until the mixture is smooth. If you wish, press mixture through a mesh strainer to remove any seeds. Chill for 1 hour, then freeze in your ice cream maker according to the manufacturer’s instructions. I was actually planning on making this very soon. Looks delicious! This is perfect, especially for the strawberries we’ve been getting from FL that are good but not GREAT. Looks tasty delicious. I’m going to try this! I have some strawberries that weally weally want to made into this. I shall indulge them….. right now.